Life cycle: This insect produces one to two generations each year. The eggs are deposited singly and hatch within three to eight days. The larvae reach full size in three to four weeks of steady eating. Overwintering is done as hard-shelled pupae, three to four inches below the surface of the soil. The moths appear in May or June. One generation is common in the North, while the South may have to contend with two or more. Physical Description: This 4-inch long caterpillar is green with seven or eight white stripes and a black horn sticking out from the rear. 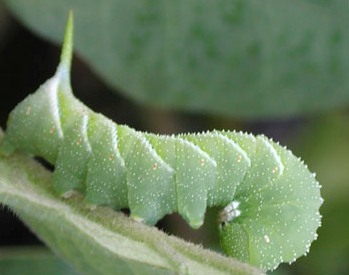 A similar caterpillar is the tobacco hornworm. The adult moth is gray or brown with white zigzags on the rear wings and orange or brown marks on the body, and has a wingspan of 4 to 5 inches. Feeding characteristics: This pest attacks eggplant, pepper, potato, and tomato plants by chewing the leaves and fruits. Controls: The Braconid Wasp lay eggs on Caterpillars, forming little white cocoons on the skin. Trichogramma Wasps parasitize hornworms in the egg stage. Most plants can tolerate some feeding, but if the caterpillars become a problem, handpicking is the best approach.